Yacht Controller is the Winner of the NMMA National Marine Manufacturers Association Award for the Most Innovative Product, and with thousands of units installed on 105 brands of yachts, patented and FCC certified has proven itself worldwide. 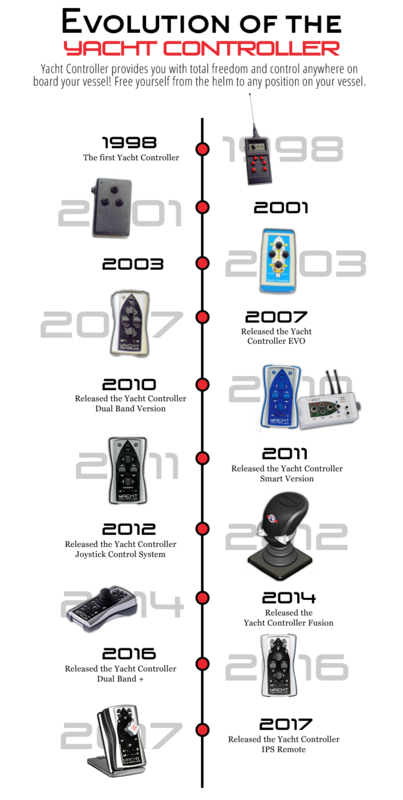 Yacht Controller has all of the many superior safety and operating features necessary and required for safe and reliable operation, beginning with the fact that it does not bypass OEM (Original Equipment Manufacturer) control systems. It would be foolish for any yacht owner or yacht manufacturer to contemplate even for a moment, any system which bypasses the sophisticated and elaborate safety systems built into any boats electronic control system whether it be Mathers, MAN, Glendinning etc. on the basis that anyone’s system should somehow eliminate those company’s control systems. These major companies have invested heavily in the reliability and safety of their systems, and almost all including Glendinning are utilizing CAN BUS technology to further ensure that reliability and safety. (Please see the attached article posted on our web site www.YachtController.com, to read about this very subject and the important reasons for CAN BUS systems). To bypass that technology with “home made systems” is to invite serious mishap to yachts, transmissions and to persons, not to mention simply voiding warranties. In fact, these "home made" remote systems, have caused damage and destruction of yachts electronic control systems and have resulted in costly replacement, as in a recent incident where a “home made” system destroyed the control system of a boat on the USA West Coast. Glendinning has partnered with Yacht Controller, because as a manufacturer they recognize the superior technology of our product as opposed to these ‘home made systems” that have destroyed their electronic control systems. This relationship has further evolved into a joint product developed between us known as YAMAS (YAcht Controller Mechanically Actuated Systems) which has been successfully marketed for the last year. Yacht Controller's superior technology is used on more than 105 brands of yachts such as Palmer Johnson 123’, Hatteras, Lazarra, and others where their large mass makes reliability of paramount importance. Following the basic and primary rules of all wireless and many wired systems, a Yacht Controller acoustical alarm signal lets the captain know when the unit is on and activated. Then Yacht Controllers "take Command" function by pushing the button silences the alarm. THIS IS exactly the same procedure used with ALL reputable and safe electronic controls systems, in order to maximize safe operation and to avoid any mistakes. Yacht Controller also automatically shuts off if not used for four minutes and in that case, sounds an alarm to alert the operator that the receiver is still on and active, as a further safety measure. Yacht Controller's six times per second redundancy is the fastest available communications between transmitter and receiver (almost 50% faster and more reliable than any RF signal), and since Yacht Controller has a US patent on our technology and is the ONLY PATENTED SYSTEM, any other boat wireless control concept is necessarily limited to inferior and obsolete technology. Another Yacht Controller safety feature is its ergonomic design and proprietary silicon lever switches (developed by Porsche Design). These allows a user to intuitively operate the system without the need to constantly glance down at the controller, thereby eliminating the possibility of a costly mistake should the operator taking their eyes off where they are going, or by pushing the wrong button. Buttons that are the same shape and without direction, obviously lead to confusion and accidents especially in those challenging situations. The Yacht Controller silicon membrane levers are contained in a housing which is waterproof and floats. Yacht Controller Systems come complete with highly detailed information and user’s manuals for both installers and owners thereby further insuring the safety and integrity of the product and its use and our product carries a two year manufacturer’s warranty. Yacht Controller’s thousands of installed units have never caused a failure to an engine control system manufactured by any OEM, and have never been the cause of any damage to any yacht or person. With this record, you can be sure that our system proves its reliability every day. Yacht Controller is easy to install and designed to the highest level of technology. Our system digitally interfaces to CAN-BUS systems designed by Glendinning, MAN, MTU and many others on a simple plug and play basis with no cutting and splicing of wires, thereby eliminating wiring errors and the chance of faulty workmanship. Our testimonials are from true customers, not a few buddies or captains in the field who we socialize with, and will say what we ask them, but a cross section of yachtsmen throughout the country who have used Yacht Controller for years on their yachts, AND love it, these are true testimonials! Once you try our system you will be glad you did, and you will enjoy the independence of wireless freedom in controlling your boat with ease and perfection.